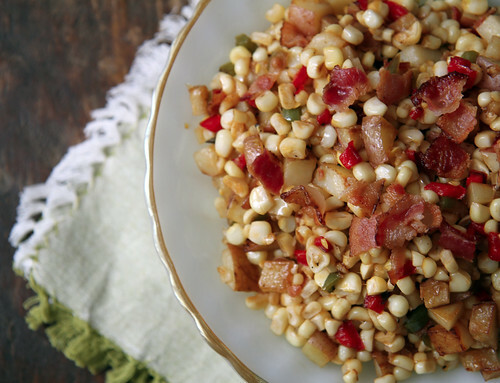 Summer is now in full swing and that means that there is corn of plenty! 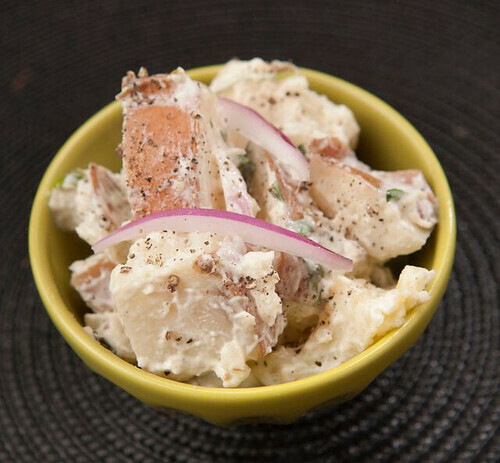 Although many of you are committed to making your tried-and-true dishes this 4th of July, consider trying this great twist on a potato salad from one of our CSA members, Holly from Buttercup and Bourbon. 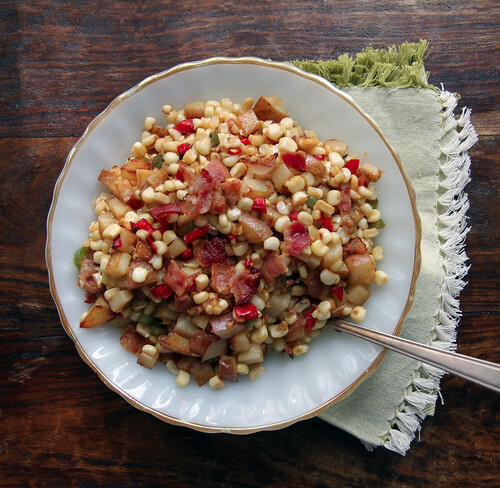 This vinegar-based warm salad has an extra kick with a splash of Tabasco. Not for the shy of flavor, enjoy! In a large skillet over medium heat, cook the bacon until crisp. 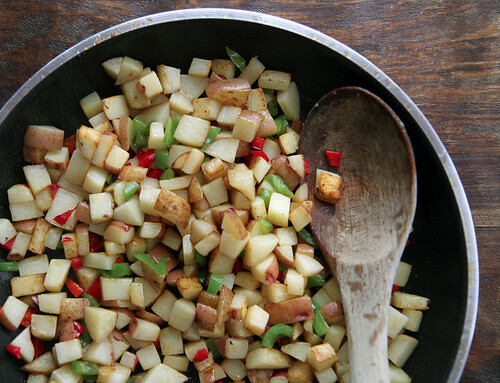 Discard all but 3 tablespoons of the bacon fat from the skillet, and add the potatoes to the skillet. Cook the potatoes for 5 minutes or until almost tender. Add the diced bell peppers and onions to the skillet and continue to cook over medium heat for an additional 5 minutes. Add the corn kernels to the mixture until heated through, about 3 minutes. Remove the skillet from heat and add cider vinegar, Tabasco sauce, and salt and pepper to taste. Crumble the bacon and stir into the salad to combine. Serve and enjoy! How To Add Corn, Onion, Potatoes, Apple Cider Vinegar To Your Delivery: CSA members - head on over to our online Farm Stand Market to customize your upcoming delivery. Market is open from noon on Thursday until 10 am, 2 days before your scheduled delivery day. After you confirm your produce items, click the orange button "Confirm and Continue To Other Farm Products" to add the products to your delivery. Father’s Day is almost here, and we wanted to show our farm family Dads a little love with a giveaway that honors the art of a good barbeque. 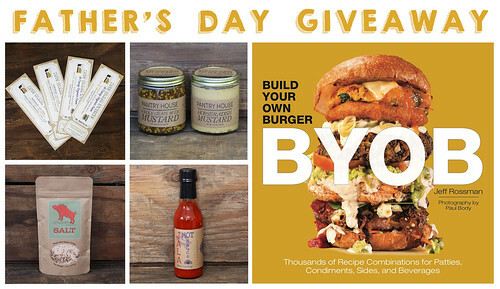 Since we know there is a good chance that your Father’s Day get-together will include some grilling action, our giveaway includes some barbeque must-haves, such as farm fresh mustard from Pantry House, some Jala Hot Sauce from Say Hay farms, artisanal Omnivore Salt, 4 tickets to a Farm Fresh To You festival or farm tour of your choice and BYOB: Build Your Own Burger, a go-to book for impressing your guests with delicious, out-of-the-box recipes (including a vegan black-bean quinoa burger) for your next family barbeque. 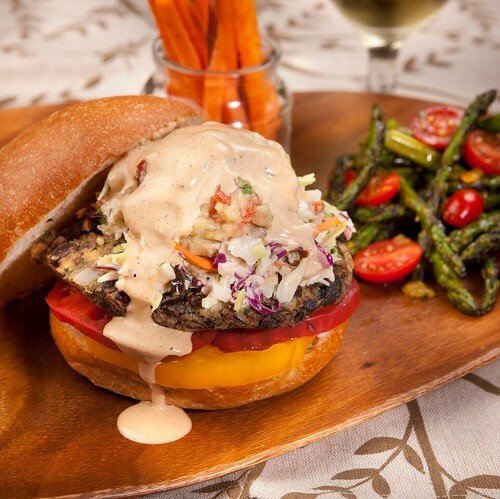 To help jump start your menu, we are sharing a few stand-out recipes from Jeff Rossman's BYOB that we think your Dad is sure to love. and onion for about 3 minutes, until tender. Stir in garlic and mushrooms and season with salt and pepper. Continue sautéeing for 30 seconds and add wine. Let wine cook down until almost dry. Remove from heat and let cool. In a medium mixing bowl, combine the sautéed vegetables, kosher salt and beef well. Divide the mixture into 4 equal portions and flatten into patties. At this point, the patties are ready to throw on the grill and cooked to your preference. Put half of the black beans in a medium mixing bowl with the quinoa, oats, smoked paprika, cumin and thyme leaves. Put the remaining beans in another medium mixing bowl. Heat half the olive oil in a sauté pan and cook the onions until golden brown. Divide the cooked onions between the two bowls of black beans. Heat the remaining half of the olive oil in the sauté pan and sauté the poblano peppers and garlic until golden brown. Add jalapeño and sauté for another minute, until tender, and combine with the bowl of black beans and onions. Add the green onion, basil and cilantro to the bowl with the beans, onions, poblano peppers, garlic and jalapeño. Put the mixture into a food processor and pulse 5 or 6 times. With a spatula, scrape down the sides and pulse another 5 times. Combine the mixture with the other bowl of beans, quinoa and oats and mix thoroughly. Divide into 4 equal portions, and form into patties. Refrigerate overnight to dry out. At this point, the patties are ready to throw on the grill and cooked to your taste. Boil the potatoes until tender and allow to cool before mixing. In a large mixing bowl, combine all the ingredients and toss until potatoes are well coated. Make the dressing: Place all the ingredients in a blender and purée until well combined. Prepare the beets: Put the beets in a large oven safe pot and fill about a quarter with water. Cover with aluminum foil or a tight fitting lid. Put the pot in the oven and cook until a toothpick can pierce the beets easily, about 30 minutes. Remove from oven and put the beets into an ice water bath to cool. Rub the beets: the skin should come off easily (if not, you can use can abrasive towel to do the trick). Dice the beets into ¼-inch pieces. Toss the beets with the oil and salt and pepper and put them onto a sheet pan. Roast for about 5 minutes, or until the beets have a nice dark color. Let the beets cool until serving. 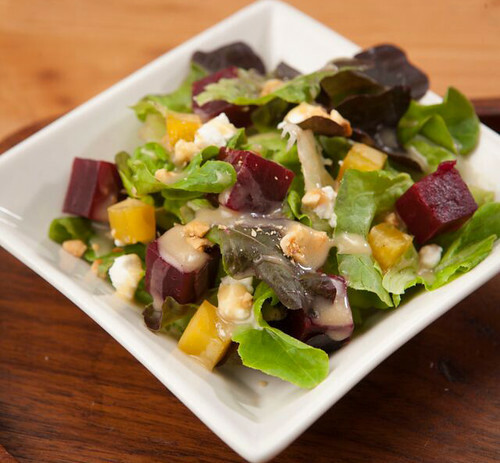 Toss the spring mix with ¼ cup of the dressing and arrange on a platter or individual plates. Add the beets, goat cheese and the macadamia nuts, and serve. We hope you enjoy and have a Happy Father's Day! 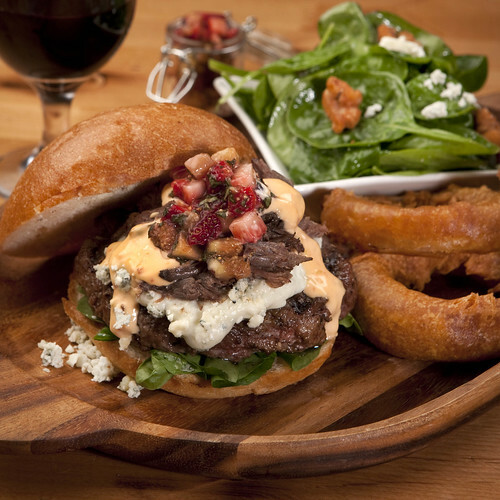 All Recipes from BYOB: Build Your Own Burger by Jeff Rossman, courtesy of Georgian Bay Books. To enter to win the Father’s Day Giveaway, simply leave a comment below answering this question by Wednesday, June 17, 2015 at noon (one entry per person please). What is Dad’s Favorite Dish? No purchase required. Limit one entry per person, please. Entries will close on Wednesday, June 17, 2015 at noon. Winners are chosen by Random Number Generator and announced on our blog on Thursday, June 18, 2015. The winner chosen at random is Annie who said her Dad's favorite dish is Shepard's Pie. We are so excited to offer our heirloom Royal Blenheim apricots in our boxes this year! Blenheims have a short 2-3 week harvest period, so they are only available for a limited time. These special summer treats are luscious, aromatic and delicious, and yet are in danger of becoming extinct. Blenheim apricots are listed on Slow Foods Ark of Taste, which is a catalog of endangered heritage foods. The Ark is designed to preserve at-risk food that are sustainably produced, unique in taste and part of a distinct eco-region. 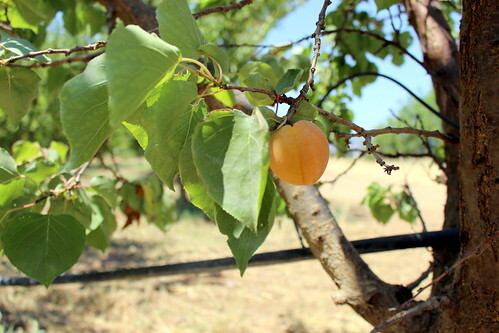 Blenheim apricots used to be a common crop in California. In the early 1900s, they were some of the most widely planted apricot varieties because of the halt of imported dried fruit from Europe during World War I. Packing houses used to fill trains by the rail car destined for New York City. 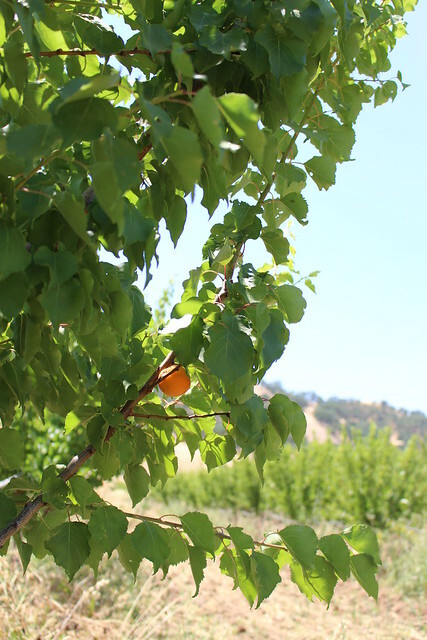 In the 1960s however, earlier-maturing and more transportable varieties became more desirable apricots to farm, and Blenheim apricots slowly started their decline in California. Currently, Blenheims account for less than 2 percent of overall production, and the number is expected to dwindle further as more trees may soon be uprooted. 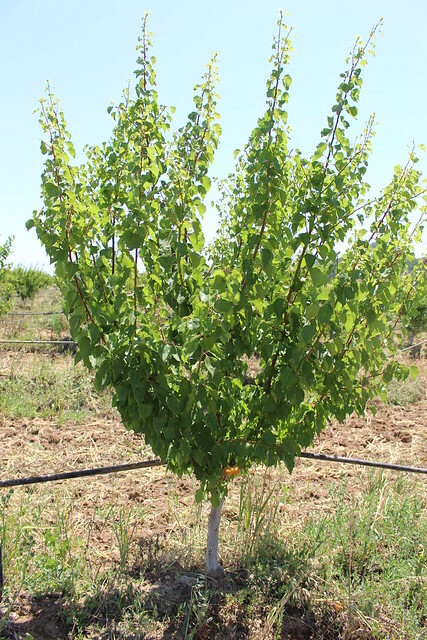 We had a few rows Blenheim trees on the farm in Capay and always received rave reviews about the fruit. Last year, we decided to plant an additional 8 acres, and we are truly excited about the new addition! They are already five feet tall, and we are able to harvest a small amount this year to offer to our CSA members. These beautiful stone fruits ripen from the inside out and are strategically picked at the peak of ripeness. 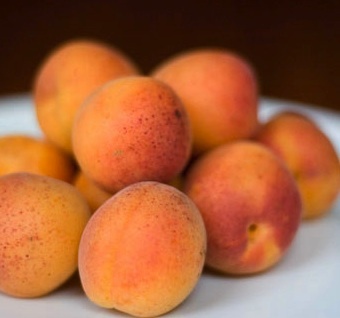 They are lighter in color, never really getting the total apricot color and may still have green-tinged shoulders - you will notice they still taste just as sweet when you bite into them. They are also a bit smaller than some other apricot varieties, but their perfect balance of sweet and tart and amazing honeysuckle aroma can't be beat! Blenheims are the perfect snack and are also good for jams and desserts. We hope you enjoy these precious, heirloom apricots. Thank you for your support in helping us bring back this endangered fruit. 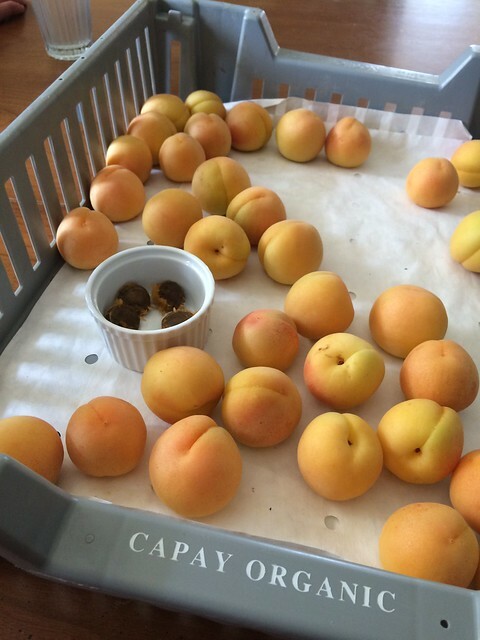 How To Add Blenheim Apricots To Your Delivery: CSA members - head on over to our online Farm Stand Market to customize your upcoming delivery. Market is open from noon on Thursday until 10 am, 2 days before your scheduled delivery day. After you confirm your produce items, click the orange button "Confirm and Continue To Other Farm Products" to add the products to your delivery. There are a handful of smells that hold a special place in my heart. Among them is the rich, musty fragrance emitted by dry soil getting its first drops of water. Another signature scent is the sweet aroma of carrots the hangs over a carrot field as it is being harvested and yet another favorite farm smell is the tomato smell transferred from a sticky tomato plant to your hands (which doesn’t wash off). But the smell that holds the most special place in my heart, perhaps because it was first pointed out to me by my dear mother, is the perfume of the citrus blossom. It is intoxicating. The blossoms are long gone now. They have turned into little green marbles of fruit. 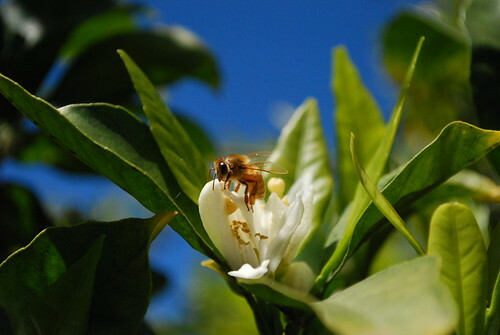 In the spring, I watch the citrus trees like a hawk, waiting for the delicate clusters of white flowers to emerge from the tree so that I can bury my nose into them, breathing in the sweet smell, experiencing the beauty of our existence in nature. 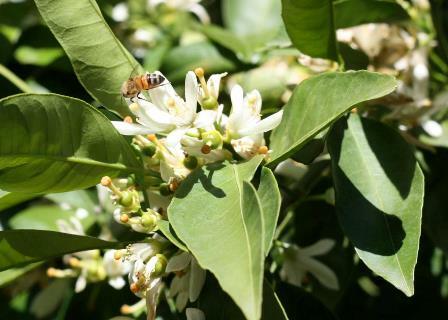 In the cycle of a citrus tree’s life, the step that comes before that smell, in the heart of spring, is the planting of new citrus trees. This obviously only happens once in the course of the many years in a citrus tree’s life, but it is like our own day of birth. It must come before all the other things can happen. We have added another satsuma mandarin orchard to our farm because each year we have seen the demand for these early mandarins grow so much that we are unable to get even our Farm Fresh To You customers enough of the fruit in the month of October. As farmers, we face the issue that planting and caring for these orchards until they begin to yield fruit (5 years) is costly and often requires borrowing money. 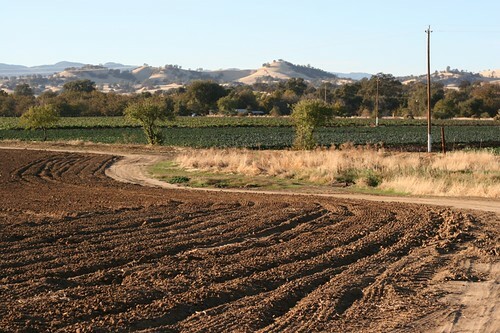 As such, several years ago our farm started a Green Loan Program, an innovative program that connects farmer and consumer by allowing our customers to participate in a mutually-beneficial investment partnership. In simplified terms, qualified individuals can loan our farm money through our Green Loan Program. We then use the capital to bring new farm projects, like a new satsuma orchard, to reality. Investors can choose if they would like to receive a variable annual interest rate in cash or in Farm Fresh To You credits. Licensed through the California Department of Corporations as a DPO (direct private offering), our Green Loan Program is a legitimate way to invest in your food system. Through the DPO, we accept loans ranging from $2,000 to $50,000. If you would like more information, please email my team at greenloan@farmfreshtoyou.com. We will get you information and coordinate a series of informational sessions about the program that I will host. This is a legitimate and secure way to let your money grow while enabling our genuine and sustainable farm to grow - let’s grow together! Have you ever wanted to grow your own farm fresh mandarins? We have a limited supply of baby Owari Satsuma Mandarin trees, the same ones that we recently planted on the farm. These ever greens are 18 months old and will be delivered to your door in a 10” x 4” x 4” pot. Your baby Satsuma tree will grow faster if they don’t have blossoms or fruit. Some people choose to remove the first two years of blossoms so that the tree can focus its energy on growing. 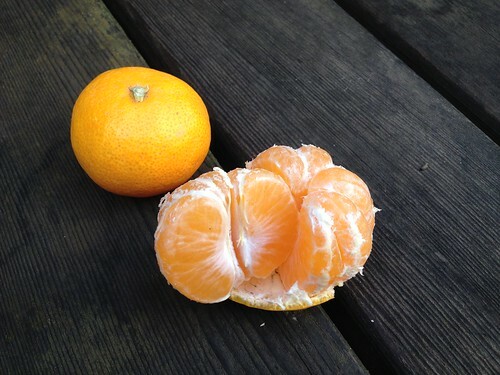 But if you decide that you don’t want to do that, your baby Satsuma will still grow-up just fine. 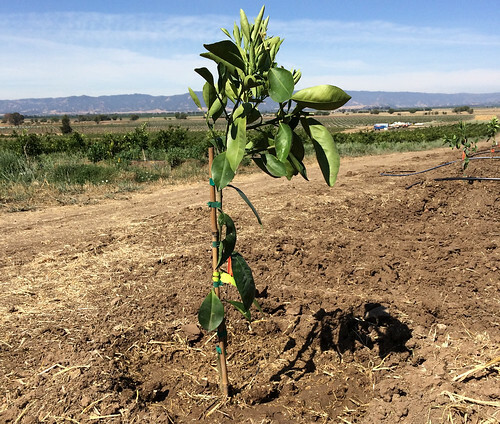 Simply plant your tree in full sun, water weekly during the hot months and fertilize once or twice a year with an organic citrus blend from your local hardware store. 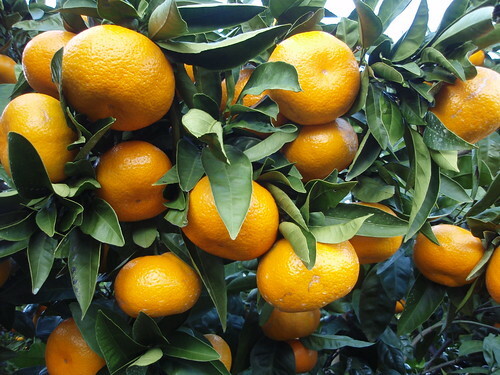 If you choose to plant your Satsuma in a large pot (24 inches in diameter), it may need to be fertilized a little more, two to three times during the spring and summer. Your baby tree, if planted in the ground, will grow to be 6’ tall and 6’ wide by the time it is full grown. Trees planted in a pot will be a little more dwarf in size. Your first harvest should be ready just in time for Thanksgiving. How To Add A Baby Owari Satsuma Mandarin Tree To Your Delivery: CSA members - head on over to our online Farm Stand Market to customize your upcoming delivery. Market is open from noon on Thursday until 10 am, 2 days before your scheduled delivery day. After you confirm your produce items, click the orange button "Confirm and Continue To Other Farm Products" to add the products to your delivery. It is the middle of summer planting, and the beginning of the fall planting schedule. The white board in my office with a “chickenscratch” to-do list is growing faster than items can be crossed out. First thing in the morning, I find myself by the creek, marking out a small, buried main line and putting flags where the risers can go so that Ricardo can get the irrigation system installed. This irrigation system has nothing to do with growing the crops; it didn’t even make it onto my to-do list, but it has been nagging at me for over a month. The ground is sandy. It runs along the creek and for the past years, we have been fighting noxious weeds. The only permanent solution is to get the area established with good plants – native grasses, shrubs and trees. Those native grasses, shrubs and trees have been sitting by the office for over a month, approaching two months. In the winter, when things were slow and the most important thing on my list was rehabilitating that wild area by the creek, I put an order in for the plants. I put them next to the office so I wouldn’t forget about them. Days stacked to weeks that rolled into months, and the plants were still there. The final straw was when I went to pick up a tray of deer grass to examine it, and it was stuck to the ground. Its roots had grown through the plastic cells, past the gravel and firmly embedded themselves into the soil. Yup, time to get these in the ground before it really is too hot. The wild area is one of my favorite places on the farm. In it live the community of flora and fauna that have always been dear to my heart. It is in this location, where the creek flows and old cottonwoods grow tall that I am reminded of our farm’s responsibility to foster a diverse ecosystem. It is the acre oak preserve with trees a few feet tall where I learned the valuable lesson to never ever plant native plants until a drip irrigation system is set up. As I wandered around, laying out the system, imagining how great this will be in a few years, I had to chuckle about myself and how well I know myself. 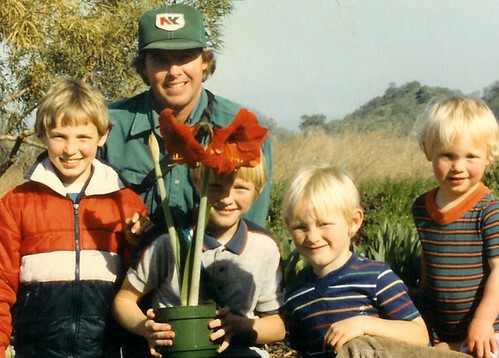 In the spring, when I ordered those plants, I knew I was overloading the early summer – I did it anyway. Check out the progress on my Instagram (@farmerthaddeus) and while you are there follow our company’s Farm Fresh To You account (@farmfreshtoyou).